This might just be my favorite update of all times! 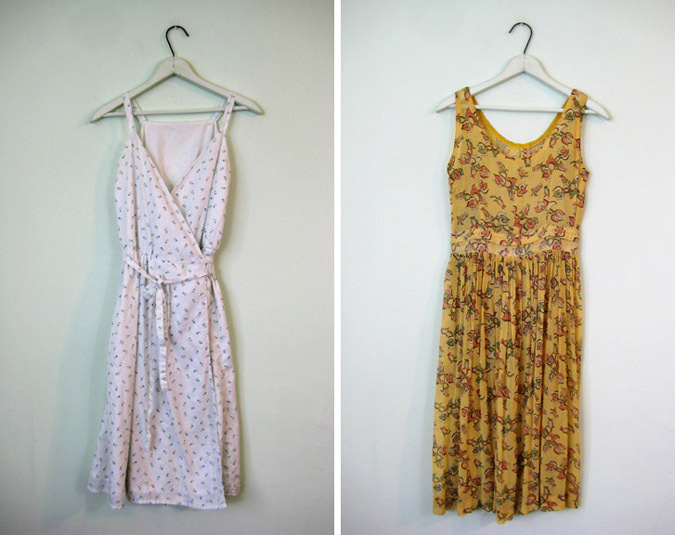 These are just the kinds of dresses I'm dreaming about living in this summer. In fact, a few of these are my size and I might come to my senses and grab them for myself if some other lucky lady doesn't nab them out of the shop first. I've received several questions over the past couple of weeks that I thought I'd take a second to answer. I try to answer your questions right away and but I know that sometimes they slip through the cracks and before I know it, days have passed and they're still sitting in my inbox. So sorry! While I'm at it, are they're any other pertinent questions you'd like to know the answers to? Leave them in the comments and I'll add them to this list. Thanks! This question came up multiple times after posting the photos shopping with Andreja at the Chelsea Flea Market. For the record, I’m a not-too-tall and not-too-short 5’6”. Andreja’s just really tall (like 5’11-ish)! I realize walking next to her makes me look like a bit of a shrimp especially since I was wearing sensible flats. I’m thinking about starting to sell vintage online. Do you recommend Ebay or Etsy? Looking back, I can’t believe it took me as long as it did to swap over from Ebay to Etsy. I can’t imagine ever going back. I understand why long time Ebay users are hesitant to make the switch after building a regular customer base on Ebay but for new sellers, I would recommend Etsy 100%. I think Ebay is sort of like shopping at a big, messy mall where you are barraged with junk around every corner and it takes hours to find the good stuff while Etsy is more like shopping at a small flea market where the vendors are friendly and you find lots of handmade goods among the vintage treasures. I was wondering if this shop is what you do for a living, in other words, is is possible to make a living that way? Also, how did you start doing this, and how did you promote yourself to make your shop so well known? 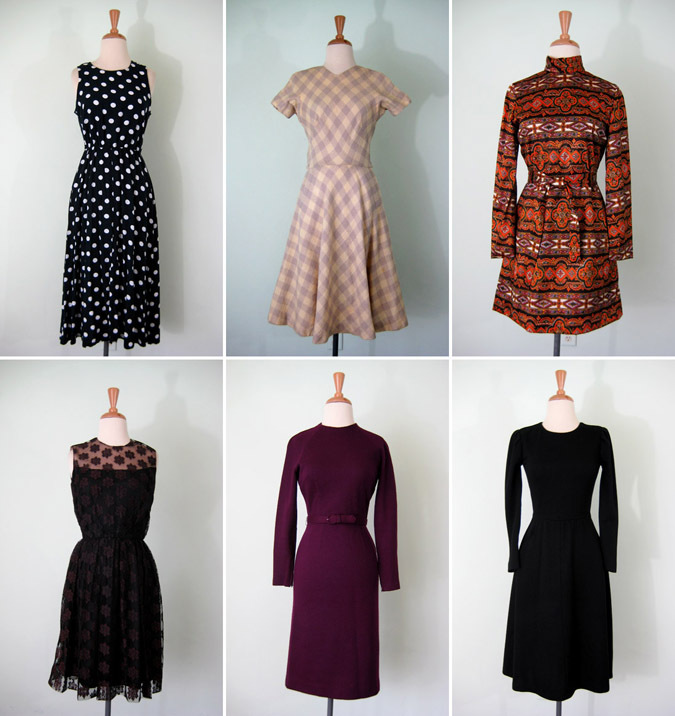 It is possible to make a living selling vintage online. I think the trick to it is, you still have to treat it like a full time job. To be really successful it has to be more than just a hobby. It takes a lot of work and dedication but it's also very rewarding. Most of the Etsy and Ebay shops out there are run by a single person (as is mine). You're the buyer, the merchandiser, the graphic designer, the photographer, the customer service representative, the shipper, the accountant... the list goes on! As much work as it is, I wouldn't trade it for sitting behind a desk even on my worst days. I started out selling on Ebay (for almost two years) before switching over to Etsy. When I first started out I used every means I knew to promote my shop. At that time it was pretty much Flickr, Blogger and Myspace. Now there's Twitter, Facebook, Tumblr, Chictopia, Weardrobe... again, the list goes on! 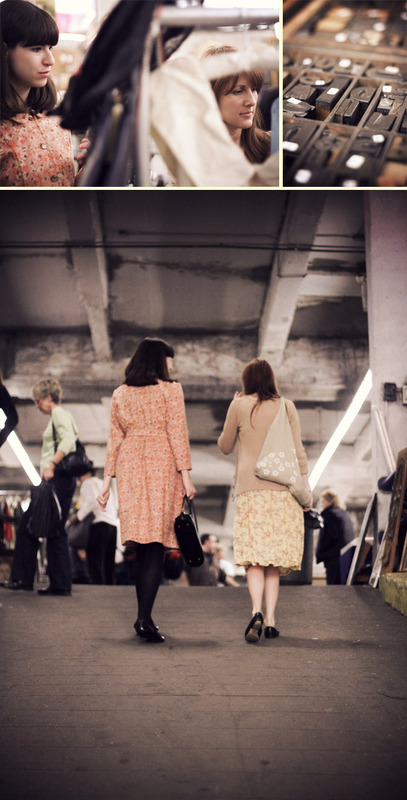 Be an active participant in the online vintage community to get your name and face out there. I've been blogging and selling online for nearly three years and my shop still isn't the most popular out there by any means. My point is, I've been working at this for three years and still feel like there is a lot of room left for me to grow. It's not going to happen overnight and it takes work but it's totally worth it! What kind of camera do you use? What kind of camera does Tom use? 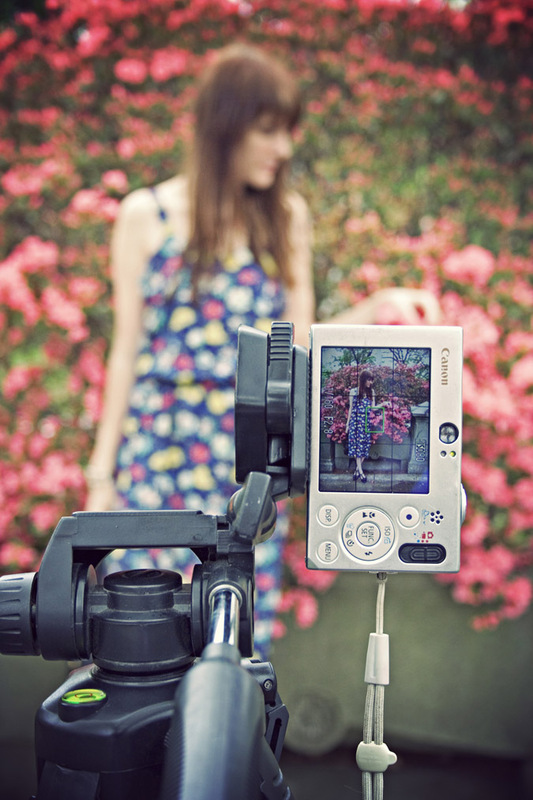 I’m still using the same little Canon SD1000 that I’ve had for years. I can’t say enough good things about this little camera. It’s been dropped, scratched and abused and yet it’s still working. Sort of amazing! I like it because it’s small enough to fit in my pocket and I the manual setting are easy to change. When Tom takes my outfit photos he uses his Canon EOS 7D. It’s big and heavy and completely amazing. It’s too much camera for me but it’s perfect for all of Tom’s explorations and I love the way the lens gives you that shallow depth of field. How do you edit your photos? What is your favorite photo-editing software? I use Photoshop CS3 to edit all of my photos. I haven’t tried any of the other photo-editing software that’s out there so I don’t have any basis for comparison. 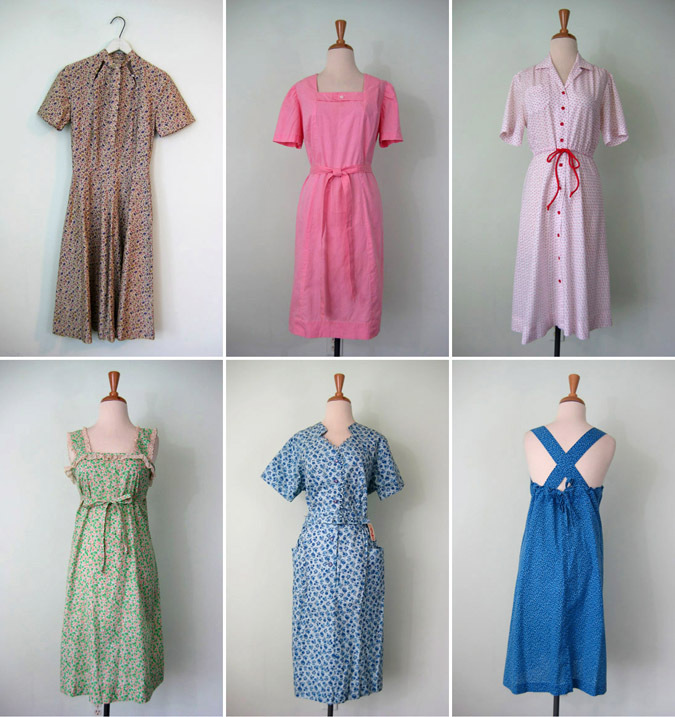 The fact that these dresses and are now considered vintage makes me feel OLD! Ha, ha! I lived in these throughout high school along with a pair of Docs and colorful tights. 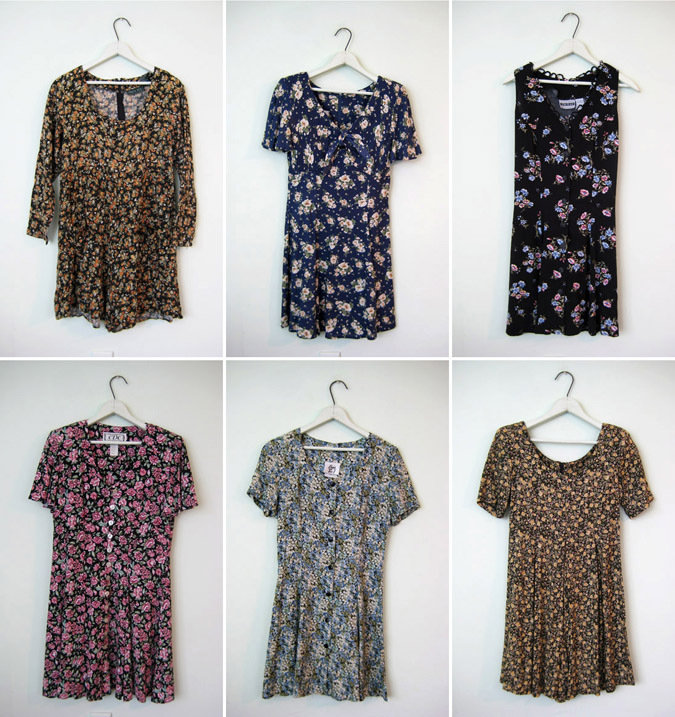 I still have quite an affinity for these floral rayon dresses and must admit that I've kept a couple for myself to wear on casual days. In fact, I've been pretty much living in them lately. All of the ones seen here have now been added to the shop! I can't remember exactly how I ran across Megan's blog, Another Day to Dress Up, but I can tell you that I've been seriously style stalking her ever since. I'm loving everything this California gals is doing from her penchant for wearing quirky hats (you know I love a good hat!) to her perfectly beat up oxford lace-ups. And did I mention what she can do with a pair of pants?! Oh, my! 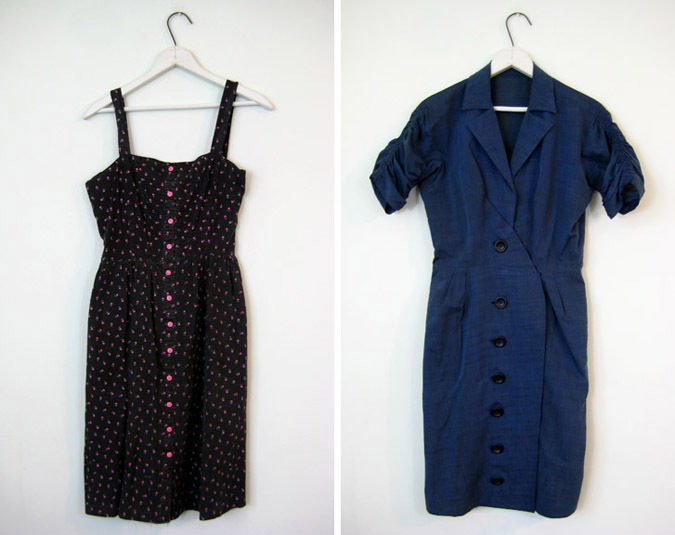 The lovely folks over at Modcloth were kind enough to send the Delightful Dozen gals their Dynamite Dress to style. I have to be honest and say when I took the dress out of the package my first thought was, "Where's the rest of it?!" It is S to the H to the O-R-T! I was determined to wear it in a spring-friendly sort of way. It's such a bright and cheerful piece I didn't want to dull it down with tights and too many layers but I also knew one slight breeze and I'd be showing my unmentionables to the masses. No good. So... I just tucked the bottom ruffle into a pair of vintage jeans and voila! It's a cute blouse instead! I discovered Cracks, an quite unfortunately named movie if you ask me, via Tara Lynn's blog and knew instantly that it was something I had to learn more about. It definitely falls into the category of movies I'd watch just for the costumes and set decoration but after watching the trailer it seems to have a decent story line as well. If you need convincing of the genius of the costumes, just take a peek at the "Moors Scene" or "Girls on the Steps". The movie seems to cover a year in the life of these boarding school students so there are winter coats and wellies for winter and floral dresses and Peter Pan collars for spring. A little something for everyone! The winter scenes make me feel a little better about this lingering winter we're having. Maybe it's not so bad to have a few more chances to dress like an English gal wandering through the moors! Salvage Life was one of the first Etsy shops that I discovered and fell in love with. 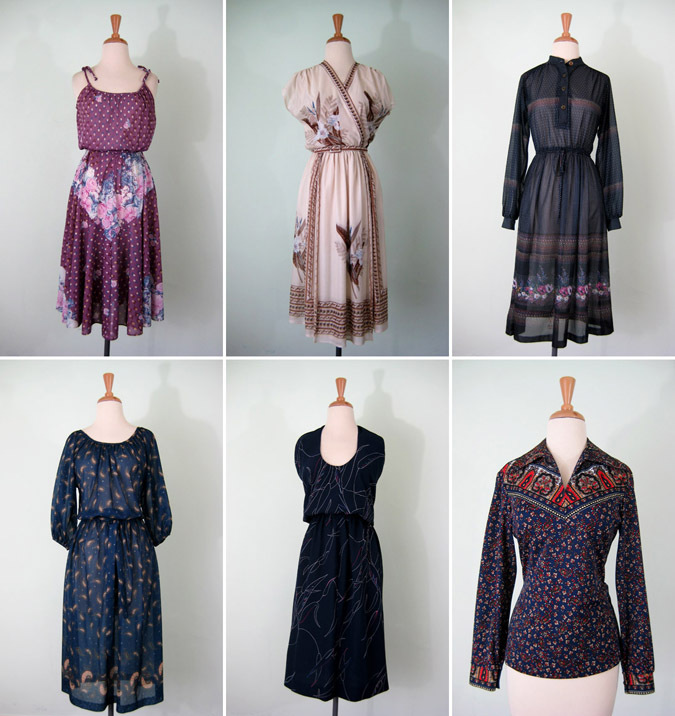 If you've ever searched Etsy for a vintage dress you've probably seen the distinctive black and white floral backdrop that surrounds all of the lovely vintage pieces in the shop. I've been kicking myself for well near a year for not snagging this little number when I had the chance. It's been sitting in my Etsy favorites ever since and I just can't bring myself to delete it. Ah, the one that got away! We all have those, don't we? So when Beth, the gal that runs Salvage Life, contacted me about working together via a sponsorship I was happy to jump at the opportunity. After spending many an hour admiring her shop, I was curious to know a little bit about what goes on behind the scenes at Salvage Life. Beth was kind enough to answer a few questions about her shop, her philosophy and the excitement of a celebrity appearing in one of her finds! SJV: Tell us a little bit about yourself. My name is Beth Giles, well actually Elizabeth, but my parents have always called me Beth. I am 28 years old. I live in Long Beach, CA with my husband and one year old daughter in a 1920's bungalow that we stripped to the studs and fixed up together. Okay, my husband did most of the work, but I picked everything out. SJV: When and why did you begin Salvage Life? I studied design and merchandising in college and have always wanted to have my own business. I was working as a merchandiser, designing window displays and selling a few things on Ebay and Etsy on the side. The vintage pieces were selling really well, so I kept it up. I never really planned on getting into this, it just sort of happened organically. SJV: Tell us a little bit about the philosophy behind Salvage Life. The philosophy for Salvage Life comes from some of my very deepest beliefs. I could try to say in in some flowery way, but this is how the thought pattern goes in my head: Many of us are extremely blessed and it just seems normal to us, so we consume ridiculous amounts of things. There are lots of great "things" already in existence, so why not look to those to fulfill our desires for something new, hip, fashionable, etc. When we save money by buying secondhand, we will have more money to give to those in need. 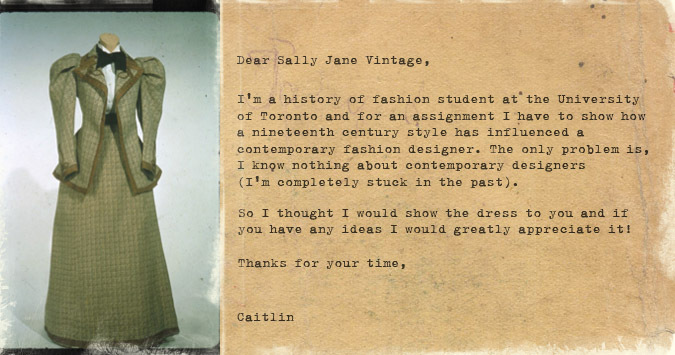 SJV: Have you always loved vintage? I remember being the first one up on Saturday mornings as a kid and anxiously waiting for my mom to wake up so we could go garage saling. I also remember wearing a butterfly print 70's polyester shirt in high school and running to a vintage shop when I needed a last minute prom dress. My love for quality vintage pieces really blossomed in college when I studied costume history and used vintage trims and buttons in my designs. SJV: Do you ever have a hard time parting with any of the clothes you sell? Yes, all the time, but not because I want to wear them, though sometimes I do. The clothes are like my babies, they are all unique and I will probably never see another one again. When I have a really pretty dress in the shop and it sells, I get sad and then I remember that sales keep me in business. SJV: Do you have any favorite vintage finds? 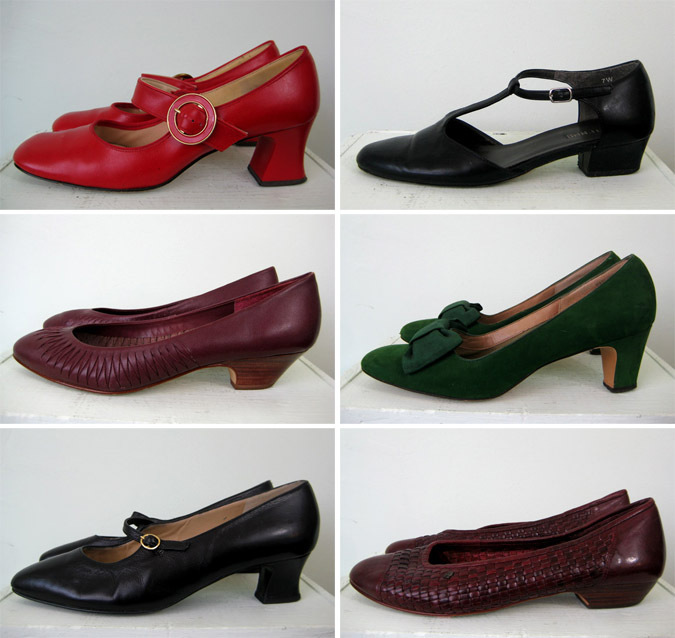 I just bought a pair of 1940's brown peep toe pumps that I am in love with. I find myself rationing the wears because I don't know how long they will last. 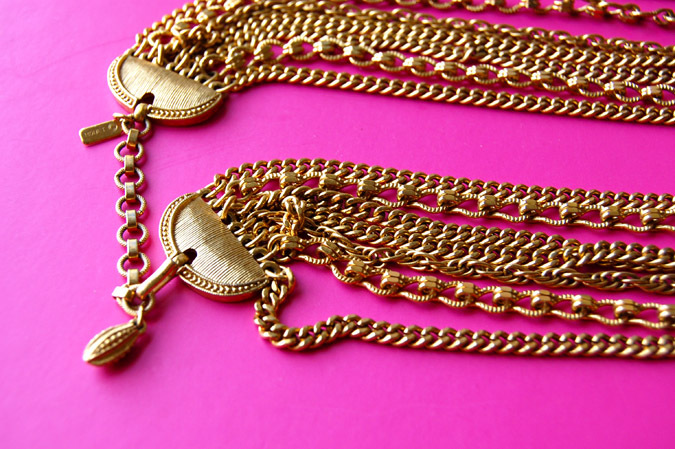 SJV: What do consider a vintage must-have for every gal’s closet? 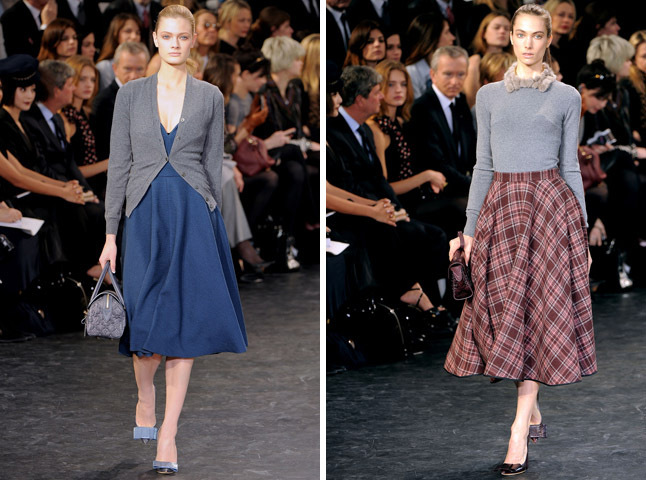 If we're talking basics: A lace blouse, full skirt, party dress, beaded cardigan and pea coat. SJV: What do you have planned for Salvage Life this year? My first goal is to continue to build brand recognition. This goal had a big boost recently because Taylor Swift bought a lovely yellow dress from our shop and is wearing it on her current concert tour! I am also working on the infrastructure of the business behind the scenes, ie. trademark, accounting practices and other boring but essential things. Lastly, my goal is always to sell lots of beautiful clothes! Thanks so much Beth! I hope you all enjoyed finding out a little more about her lovely shop as I did. If you see something you love, don't make the same mistake I did! These pretties go fast so be sure to snag yours while it's still around. OK, I'm going to risk sounding like a crazy person when I say this but sometimes I have dreams where I'm at the thrift store finding really good stuff so I wake up the next morning feeling like I need to get to the thrift store where I inevitably end up finding really good stuff! Last week I had such a dream where I found tons of leather purses. 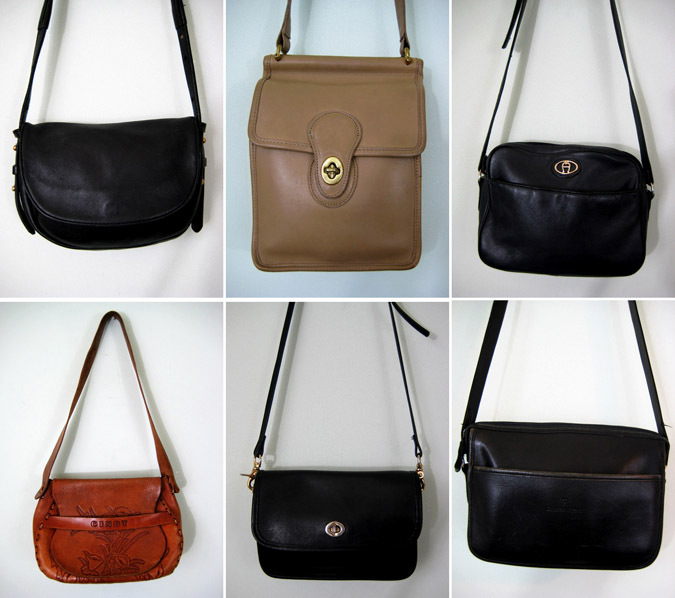 Lo and behold... tons of leather purses! I've added all of these to the Etsy shop. Oh, and if you're name is Cindy I found your perfect bag! I just wanted to take a second to say a huge THANK YOU to all of my current sponsors. 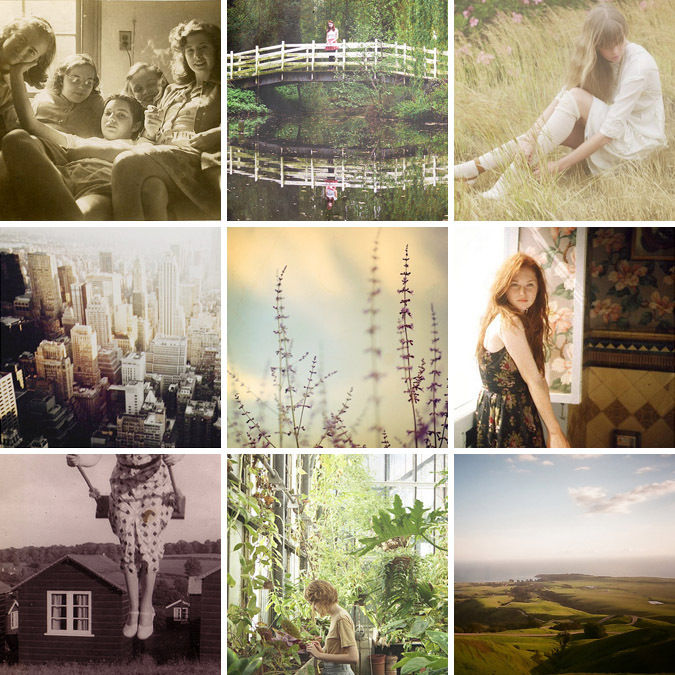 Take a look down the right side of the blog to find links to all of my lovely sponsors. I was hesitant for a long time about doing sponsorships on the blog and now I'm left wondering what all the fuss was about! It's put me in touch with so many other wonderful bloggers and Etsy sellers. I know I risk sounding a bit corny here, but I'm so happy to be part of such a friendly, supportive network of like-minded gals. Thank you ladies! - listening to: Interpol - Turn on the Bright Lights "Obstacle 1"
I've been making an effort to document more "casual day" sort of outfits. Well, we took the photos, but never got around to posting them! These were taken before our trip to NY and while there was still just a bit of snow left on the ground despite the rising temperatures. Better late than never, right? 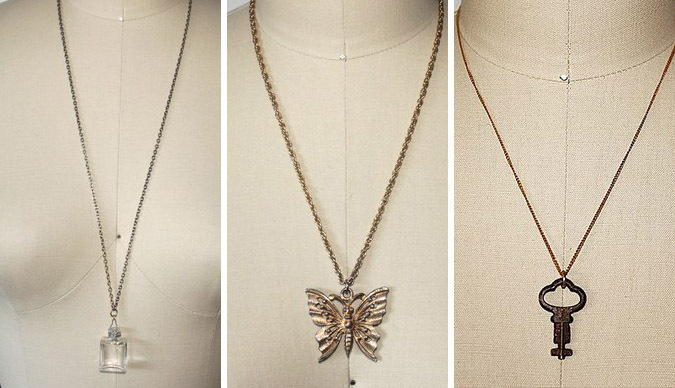 Here's a look at the pieces I've added to the Etsy shop today. 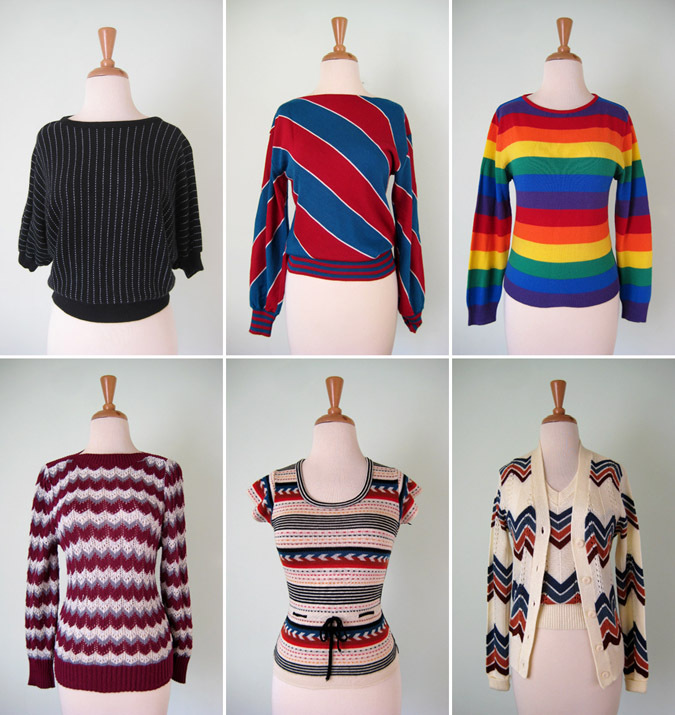 If yesterday's update was sponsored by my closet, then this update is sponsored by the 70s! Lots of cute boho (I sort of hate that word, but you know what I mean) dresses that work just as well with boots and a cardigan as they do with sandals and sunglasses. I mentioned yesterday that several new things have made their way into my closet so I thought I'd give you a little peek. I picked both of these dresses up while in NYC last weekend. The one on the left is the fixer-upper from the Chelsea flea market. It's had a nice bath and is all clean. Now it just needs a zipper and it'll be ready to go. The 60s plaid day dress I picked up at No Relation Vintage. The shop is a bit crowded and you certainly have to spend some time picking through things to get to the good stuff, but I'm a gal who likes the treasure hunt aspect of vintage shopping so I didn't mind that part. The prices were the most reasonable I found in the city. This little number only cost me a twenty spot. 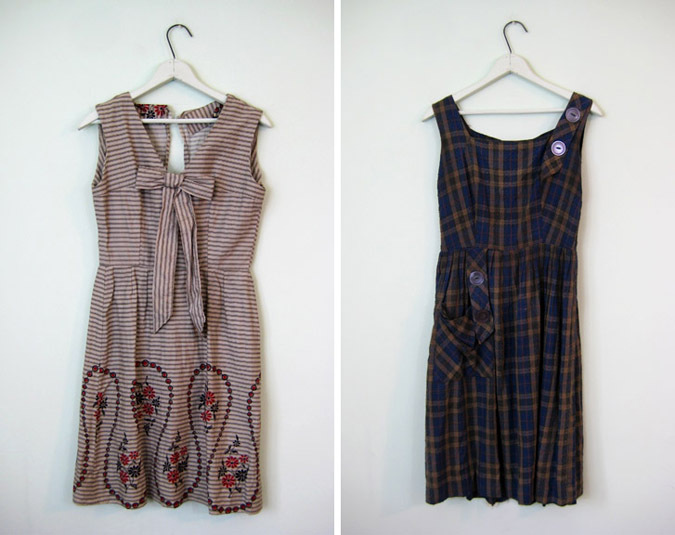 Last week when Andreja was visiting Lancaster and we did a little shopping, I came home with these two dresses. The one on the left was a bit of a hard sell for me. It leans a little to the "girly" side for me and I don't usually do such full skirts. But in the end the hydrangea print won me over and I'm happy I brought this one home. The best part of the navy wrap dress is the print which sadly, gets a bit lost in this photo. It's a little bird-on-a-wire print! These two are Etsy finds. The black floral one came to me via Tractor Dog Vintage who got it from Noir Ohio Vintage. I love when dresses get passed around like that! I'm already feeling like this will be my go-to comfy dress all summer long. The pretty indigo dress came to me via Francesca at 1385. She always has the most exquisite finds in her shop and I'm always happy to get my hands on one. Finally we have two sweet sundresses. The white floral wrap dress is the only thing I saved for myself out of all the summer stock I just sorted through for the shop. I accidentally tried it on backwards when I pulled it out of the bag and sort of liked it better than way than the right way. The 40s yellow print you've already seen. It's the one I was wearing to the Chelsea flea market. But, since you haven't been formally introduced, I thought I'd show it to you again. It came with a sweet note from the seller with a bit of history on the dress. It belonged to a lady named Dorothy who loved to play cards. I love knowing that! It makes the dress all the more special. 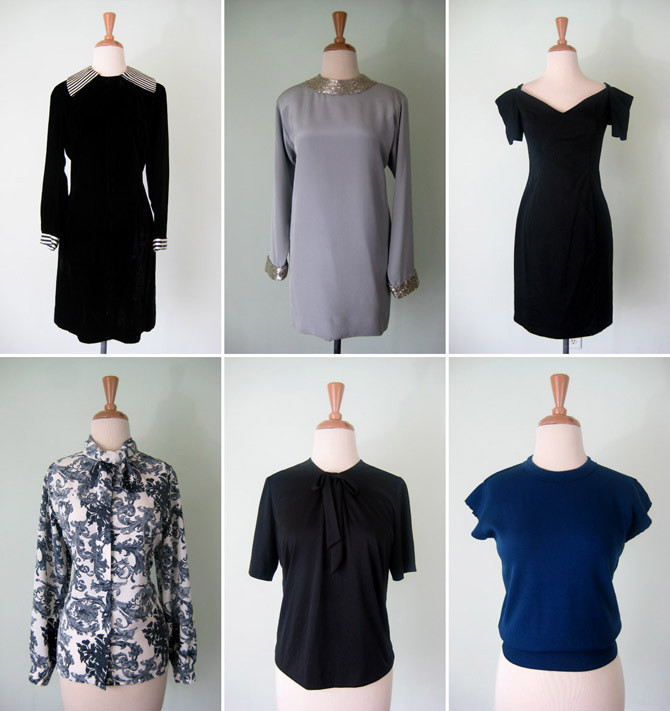 Today's Etsy shop update is sponsored by... my closet! 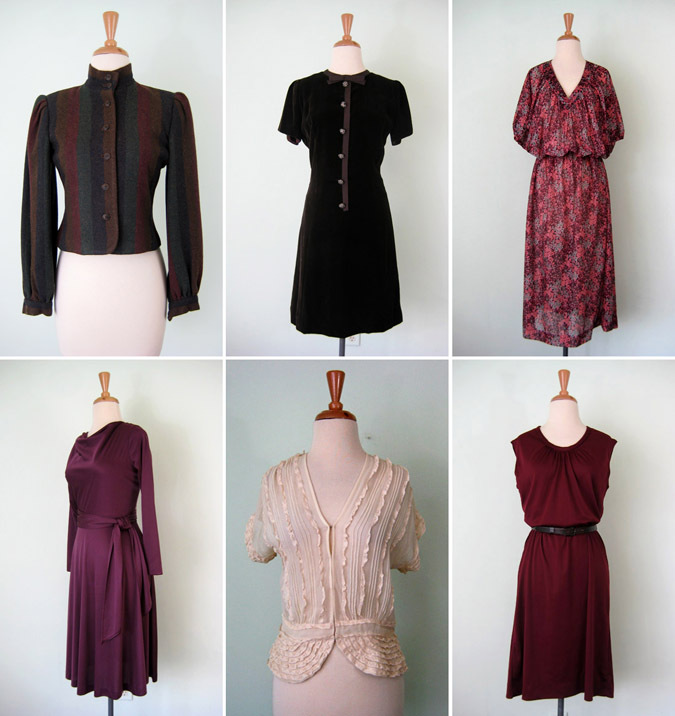 I've been lucky enough to find several lovely vintage dresses in the past couple of weeks that I'm calling my own so it's time to pass on some older favorites to new homes in order to make room. You may recognize a couple of these from past photos on the blog; like this one or this one. I try not to get too sentimental about dresses but for some reason tend to get attached to them and have a hard time letting them go. 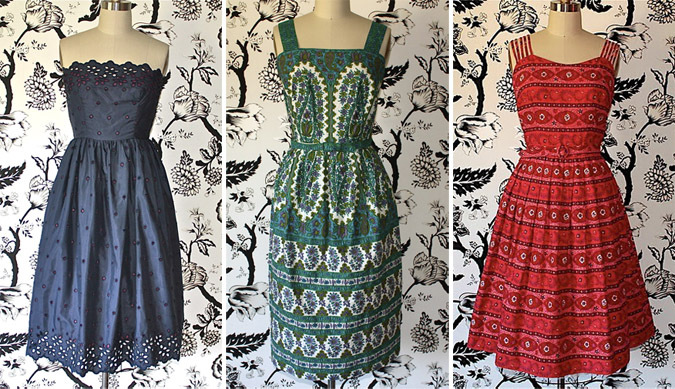 For instance, the 60s ethnic print mini dress was worn on our first Valentine's Day date in Lancaster and the black lacy one was worn to a Christmas party at the Chateau Marmont in Los Angeles so I have lovely memories attached to them. But, alas, they haven't been worn since, so it's time to find a new home for them! Navigated the city all by myself without getting lost once, ate ice cream for breakfast, walked til I had blisters on both feet, tried on a dozen vintage dress, bought two, stopped for midnight pizza slices, refused to stand in line for a fitting room at Urban Outfitters, was the least metal person at a very metal show (can you spot Tom in the photo pit? ), hung out backstage at Irving Plaza, took sneaky photos in the Lyell dressing room, had lunch at Curly's (thanks for that recommendation! ), loved No Relation Vintage on the LES, got stopped on the street by a tourist asking for directions, was actually able to give directions, ate kung pao at VP2 not once but twice, watched a Joe Strummer documentary, sat on a park bench and people watched, sat on a park bench and dog watched, saw my first daffodil of the season, hung out with old friends and made new friends. We're back! 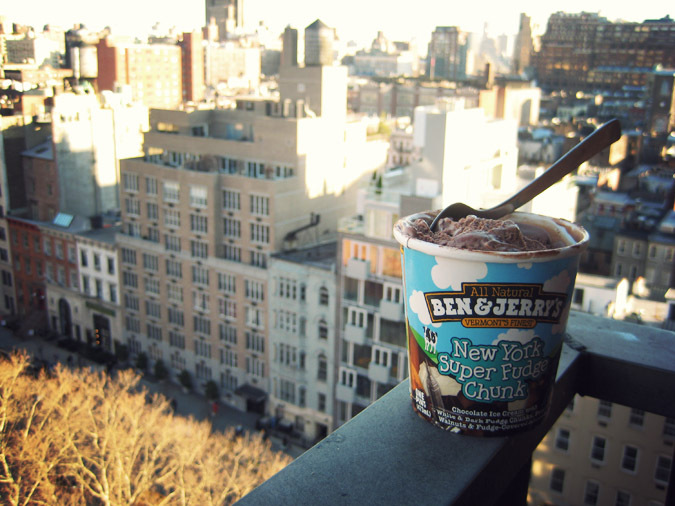 It was an amazing weekend in the city that never sleeps. Quite an accurate name since being there makes me never want to sleep. There's just too much to do and I feel like I'm missing out on something every time my head hits the pillow. There is much to share from our weekend adventure but I thought I'd start with the best part; Saturday morning at the Chelsea Flea Market with Andreja. I know I'm always going on and on about the weather but it's worth mentioning that it was an absolutely gorgeous day. A perfect day for a trip to the flea market! I've always wanted to go to the Chelsea Flea but for some reason had never made it there. I was super excited about finally going and I was not disappointed! 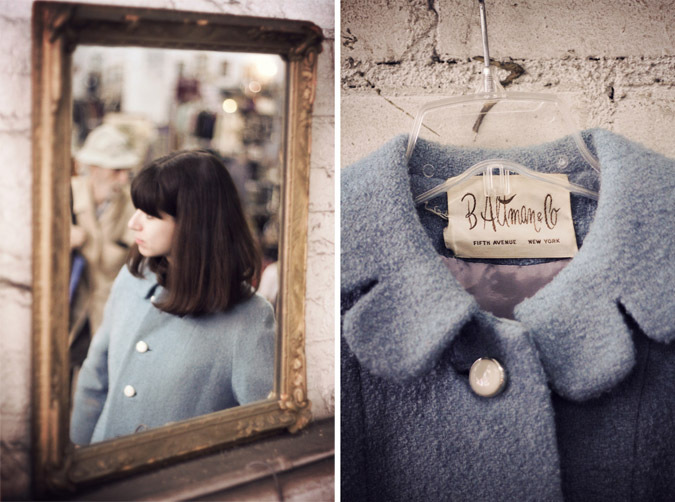 Andreja ended up taking that gorgeous baby blue coat home with her. Don't you love that notched collar?! It almost makes me wish for a few more cold days so she'd have a chance to wear it before putting it away for the summer. I was on the lookout for summer dresses. I found a few but most were out of my price range (ugh, NYC prices!). The little striped dress you see in the first photo below was my favorite of the bunch. It's a homesewn dress that was never quite finished; there's no zipper down the back. I knew it would need a bit of work but I thought it had tons of potential so I took it home with me. I think it's going to be the thing that finally gets me to find a tailor! There was much to be seen at the market besides clothes; stacks of old letters and photographs, trays full of old typeface letters, vintage cameras and lost more! I'm already getting excited about going back next time we're in NY, whenever that may be. Afterward we headed to VP2 for some veggie hot 'n sour and kung pao. Yummmm. I have lots more photos from our trip to show you... like sneaky Lyell dressing room photos! And a crazy show at Irving Plaza! But for now it's back to work time. I've got lots of goodies in store for the Etsy shop this week. It's good to be back! P.S. I'm really not that short! Andreja's just reallly tall! Thanks again for all of your suggestions on things to do while we're in NYC this weekend. I've got loads of places on my list to visit. If I discover any favorite new spots I'll be sure to let you know. I may be MIA on the blog for a couple of days depending on just how much free time I find on my hands. So... have a lovely weekend and I'll be back soon! Today was such a lovely day in weather, activity and company! It was one of those early spring days that starts off cool and gradually warms to the perfect temperature. It was the first day in months that I left the house without tights on! Yay! Small triumphs people, small triumphs. Andreja was in town for spring break so we got together for vintage shopping, crepe eating and general hanging out. We hit up two thrift stores where I stocked up on goodies for the shop and she scored a couple of dresses and scarves. Then we headed downtown to Rachel's Cafe & Creperie for lunch. 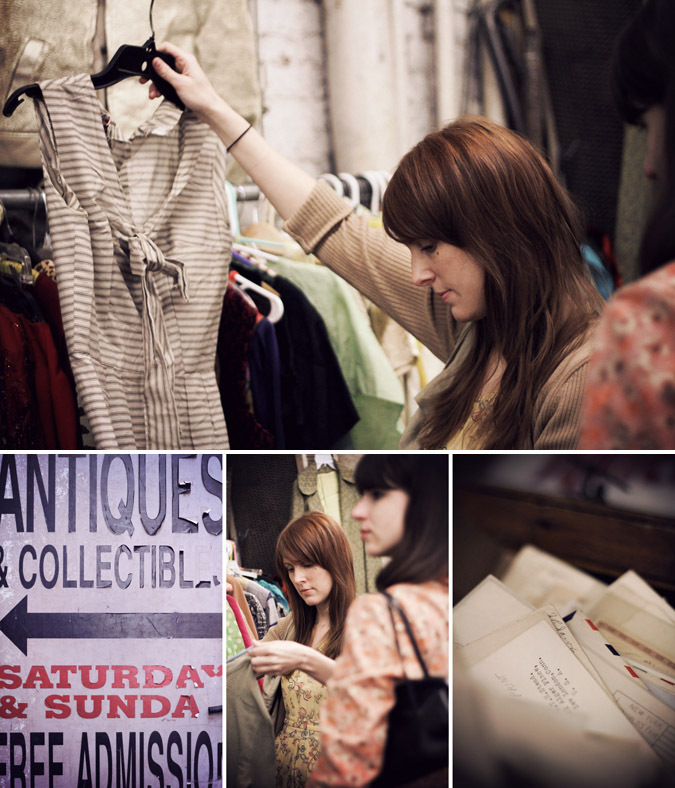 Of course Rachel's is conveniently located right next door to two of our favorite vintage shops. No coincidence! I ended up with two pretty dresses for myself. One "bird on a wire" print 60s wrap dress for a steal since it had a little stain and hyacinth print 40s sundress that I'm so glad Andreja talked me into buying. I'll take photos soon! Andreja was just as lucky, walking away with a couple of lovely dresses as well. It was a good day! This morning the sun is already shining in the windows, the air is warmer than it has been in days and the forecast says it's going to be 60 degrees outside! Perhaps I'm being a bit optimistic but I'd say that spring is officially here. So, on that note, here's a little sneak peek at all of the items I'll be adding to the Etsy shop throughout the day. Sundresses! 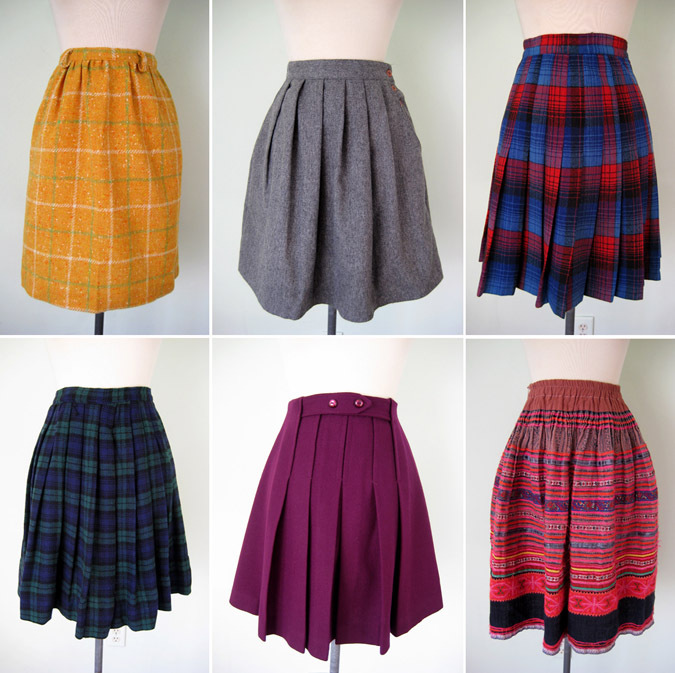 Cotton skirts! Pretty blouses! Can you tell I'm a bit excited to finally get to do this? 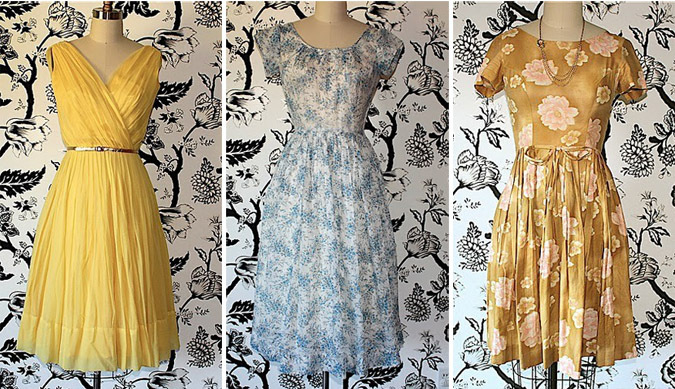 In this bunch there's a lovely yellow blouse that reminds me of the one in the Nadinoo collection, a 30s deadstock cotton day dress and the softest cotton floral dress I think I've ever laid my hands on. One of the comments that I get most often about the shop is that you ladies would like to see larger sizes. I hear ya! So, I just wanted to note that many of these items are in larger sizes (40-44 in. bust). Don't let the dress form fool you. If you see something you like, be sure to check the description for the exact size! Thanks as always for stoppin' by! - listening to: Massive Attack - Heligoland "Pray For Rain"
Thanks so much for all of your NYC suggestions. I'm finally getting comfortable navigating the city by myself and I'm so excited to check out some of your favorite spots. Eventually I'm gonna get myself out to Brooklyn but I don't think I'll brave it this trip. We're staying in Chelsea so I think most of my exploring will be around that area. I'm definitely going to hit up the Lyell shop for a little torture session (since I won't be able to afford a thing). I hear some of the early spring pieces are in the shop and I'm super excited to get a look in person. Over the weekend I toted three huge bags of spring clothes out of the attic and poured through them. It was so much fun rediscovering all of the pieces I bought months ago and forgot about. I was good and put almost everything on the "to-sell" rack. There were just a couple of things I snagged for myself that I'll show you later this week. Today I'm starting to photograph things for the shop and since I'll be out of town the latter part of the week, I'll do a big Etsy update tomorrow with pretty spring things! It's quite late (early?) and I'm not really sure what I'm still doing awake. The whole time change thing always throws me off a bit for a few days. My late night boredom led me to the Lyell site where I discover they'd posted a few looks from the early spring collection. I know I go on and on about Lyell but I really don't think they've ever made a piece or posted a photo that I didn't instantly love. Caitlin wrote to me with a class assignment that was giving her a bit of trouble. I think if we all put our heads together we can come up with some examples to help her out... any suggestions? This week, on Thursday to be exact, Tom and I are heading back to NYC for the weekend. Tom usually acts as our trip planner and tour guide since he lived in the city for years but this time he will be mostly working which leaves me a lot of free time alone in the city. So... what to do? New York gals, I'd love to hear your suggestions about what to do while I'm in the city. Are there any good art shows? Vintage shops I shouldn't miss? Vegetarian food? Will anyone else be in the city and want to hang out or do a little shopping? I checked the weather forecast and squealed out loud when I saw it's supposed to be 60s and sunny. I'm really looking forward to this trip! Especially since last time we were there is was in the teens and snowing. A little Etsy update that matches the rainy day we're having. Stop by the shop to check it out! This morning I have yet another amazing giveaway from one of my generous sponsors. But first things first. 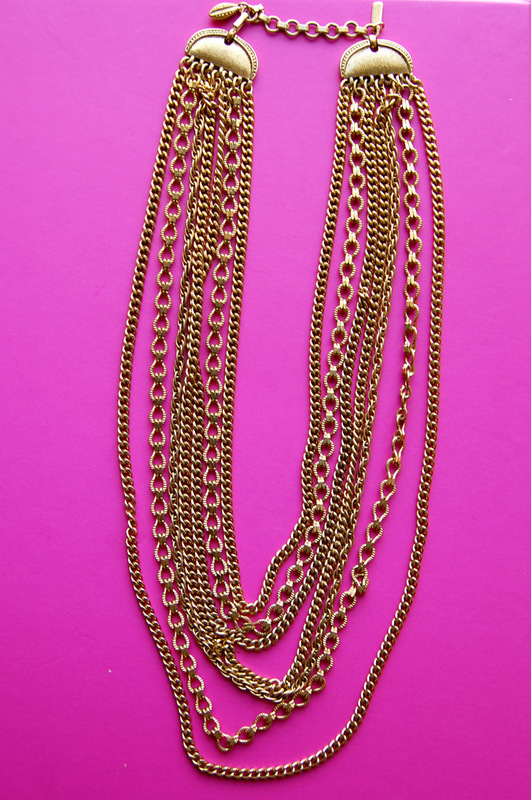 Let's announce the winner of last week's Tree & Kimball necklace giveaway. Drum roll please! Congrats to Ami from Little Miss Lovely. Thank you so much to everyone for reading this blog and for entering the contest! All you have to do is check out Annie's Etsy shop, take a peek around and then leave your comment here stating your favorite piece in her shop. Her shop is fairly new around Etsy but she's already got it stocked full with loads of pretty summery dresses, cute shoes and purses so I'm sure picking a favorite won't be hard. If you see something that catches your eye Annie is offering 15% off for SJV readers. Just enter "SallyJane" when you check out and she'll happily send you an adjusted invoice. The contest ends on Friday night so you have a week to enter, but no lollygaggin'! Hop on over and pick your favorite now. If you'd told me that the Louis Vuitton show was going to end up being my favorite of the season I'd have probably told you you were off your rocker. I guess it ends up making sense seeing that Marc Jacobs is the mind behind it all and I'm usually a fan of his work. I just typically like the Marc by Marc Jacobs best and was taken by surprise at just how much I like the Louis Vuitton this time around. The prim skirt length is especially refreshing and something I'm excited to experiment with more. That "below the knee" thing can be quite tricky to pull off. Definitely saving these looks as a reference when I'm stuck. Another little Etsy update for you in brown and plum and cream. Thanks so much for stoppin' by! Whew! It's done! Here is the last little update of the day. 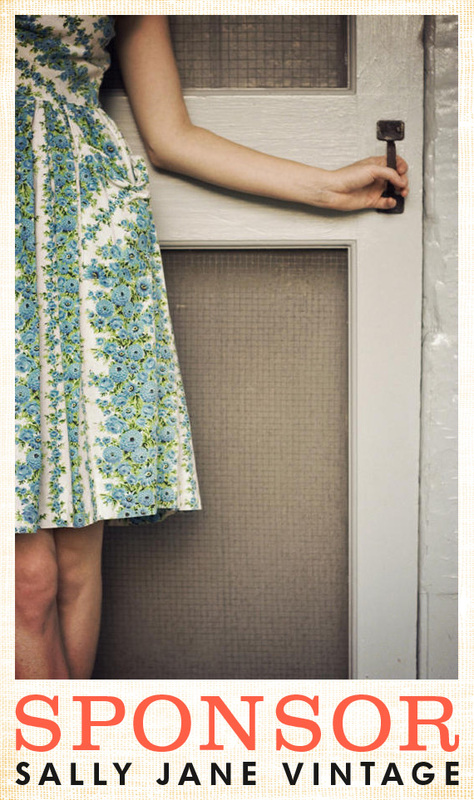 Oooh, I can't wait for warm spring days of bare legs and dresses. Speaking of dresses... I haven't forgotten about them for the Etsy shop. There are plenty on their way! Look for another little update tomorrow and Saturday then I'll be digging into lots of spring dresses for next week. I can't wait for you to see! - listening to: Johnny Cash "Folsom Prison Blues"
The other day while Tom and I were out for a sunny drive we stopped beside these train tracks to snap a few photos. We were out there for a few minutes when we heard the train whistle off in the distance. Turns out were were standing by the Strasburg Railroad line. We've ridden the train a couple of times when we've had visitors in town. It's an old timey train that takes you all through Amish country. We quickly got excited about the prospect of having the train whiz by in a photo. The only problem with that idea was as soon as the train approached and started blowing its whistle I turned into a giggling mess and ended up having to just turn away from the camera. Oh well! I think we got a decent shot out of it any way. ;) It was just so loud I think my powers of concentration temporarily stopped functioning! I'd love to say that I stayed home and worked on a shop update all day like I'd planned, but the truth is the sun was shining, the air was warm and Tom was home from work on spring break. Instead of staying inside and working we headed out on a walk around town and to several of our favorite spots. We stopped in Mommalicious to look at vintage goodies, walked along gallery row and into a cute antique shop. I picked up a couple of things for the Etsy shop that I'll be listing next week with all the spring pieces I've been hoarding all winter. One is a really cute pale yellow Peter Pan collar blouse that sort of reminds me of the one in the spring Nadinoo collection. I wish it fit me but no such luck, so it will have to go to one of you lucky gals. Speaking of Nadinoo, I've been thoroughly enjoying all of the lookbook shots from the new spring collection. Such sweet blouses and dresses and a great pair of high waisted shorts! 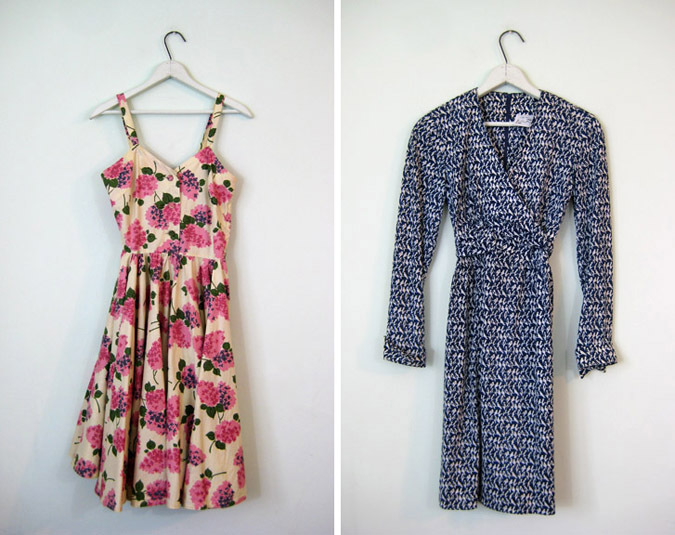 My favorite has to be the Fleur's Petal dress. The art nouveau print is just killin' me!